The willow oak tree is an ornamental tree that belongs to the red oak group. It has an excellent texture, and generally a very attractive tree. It is relatively fast growing, reaching heights of up to 60 feet above the ground, with a spread of 40 feet. 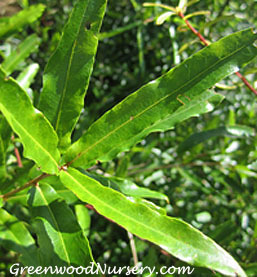 Willow oak leaves are willow-shaped, thus giving the tree its name. they are dark green, but change colors depending on the season. Just look at some willow oak pictures to see the changes – light green in spring, dark green in summer, and yellow in fall. The female flowers, like most oaks, are inconspicuous, while the male catkins resemble pendulums. These produce small ½ inch acorns that are topped by a shallow cap. The tree grows best in well drained, acidic soils in the full sun. It will however adapt to various soil conditions including poorly drained clays. It is tolerant to drought, and is ideal for urban conditions. A fibrous root system makes the willow oak quite easy to transplant. It is also very easy to maintain as long as the soil is acidic. Willow oaks are perfect shade trees for larger lawns. They are also great for lining streets or in parks. Also good along ponds and water gardens. Willow Oak or Quercus phello is known as a rapid growing shade tree and long life. A favored shade tree, it is widely planted as an ornamental. Willow Oak is easily transplanted and used widely in urban areas. Willow Oak Trees has many slender willow like leaves. Leaves are green and up to five inches long, but only about an inch wide. You can tell its an oak and not a willow, because the leaves do not have teeth, and there is a tiny hair-like bristle at the tip. Since it produces an acorn crop almost every year, willow oak is an important species for wildlife food production. In addition to being a major supplier of food for game animals such as ducks, squirrels, deer, and turkey, willow oak supplies many other animals. Blue jays and red-headed woodpeckers are major consumers, and flying squirrels utilize the tree itself for shelter.